Barbara Scheiber is an award-winning author of books and short fiction. Her novel, We'll Go to Coney Island, was recently published by Sowilo Press. 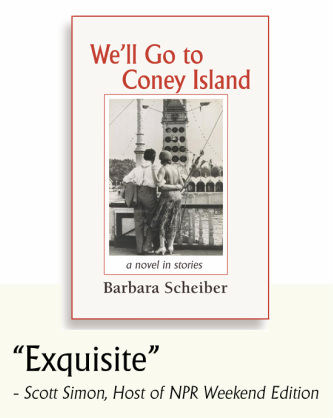 For more coverage of Barbara Scheiber and We'll Go to Coney Island, check News. The stories of Barbara Scheiber come from a special place. They are the work of a wisdom figure, a woman who understands from the inside out the beautiful imperfections of family life. Yet they are rendered with rare vision that sees everything as if the experiences were brand new. We'll Go To Coney island is a rarity--a multi-generational story that is short and fast-moving. It's the story of a Jewish immigrant family in New York in the early 1900s, and its descendants. Scheiber writes a lean, muscular prose and tells the story in quick scenes, skipping deftly back and forth in time. It captures the joys and heartbreaks of family life in all its forms. An unexpected delight. breathtaking realities nourish the reader in an absorbing and thought-provoking story of bittersweet lives.